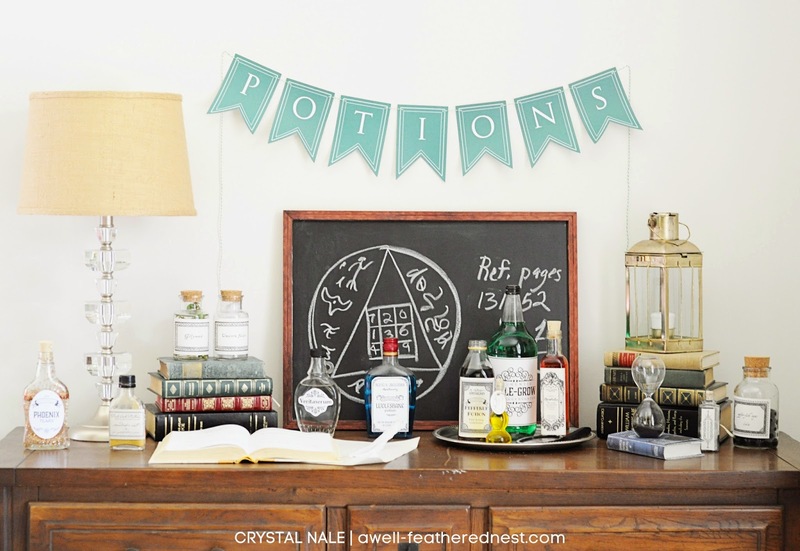 I'm finally getting around to finishing up the Harry Potter Party posts! When I decided to do the party, I knew there would have to be a potions display. 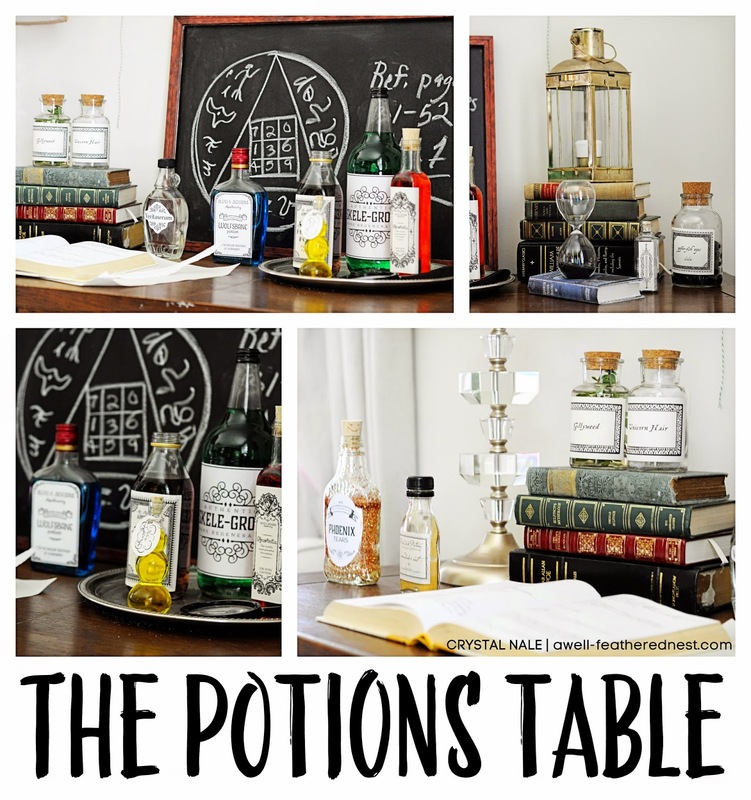 There are so many fun things that can be done to decorate with potions very inexpensively! I spent months putting this together a little at a time. I really enjoyed wandering through thrift stores looking for just the right items for the common room and potions display. When I think 'Hogwarts' I think old and well-used. What better place than a thrift store to find these kinds of items? I also spent some time collecting various bottles as we emptied them and maybe even doing a little roadside cleanup here and there. I did buy a some of the bottles that were just perfect for potions, and I picked up some corks to seal some of them up. Once I had collected enough bottles, I printed a few labels that I found online, but I designed most of these specifically for our display. You can find the ones I created in my shop. I simply printed them onto sticker paper and cut them out to adhere them to the bottles. Before the party, I let the boys help me decide what color each of the potions should be or what we might put in the bottles to serve as our ingredients. 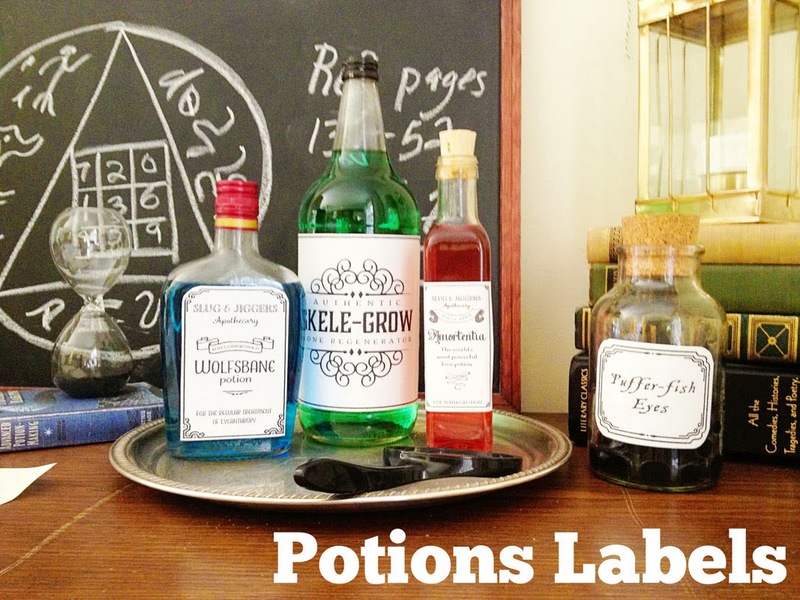 You can find the POTIONS banner for free here along with the pages I printed to turn an old library copy of The Help into a spellbook for the display. The hourglass is from Hobby Lobby as is the chalkboard. The items I thrifted were the brass lantern, the silver(ish) tray, and the smallest bottles. 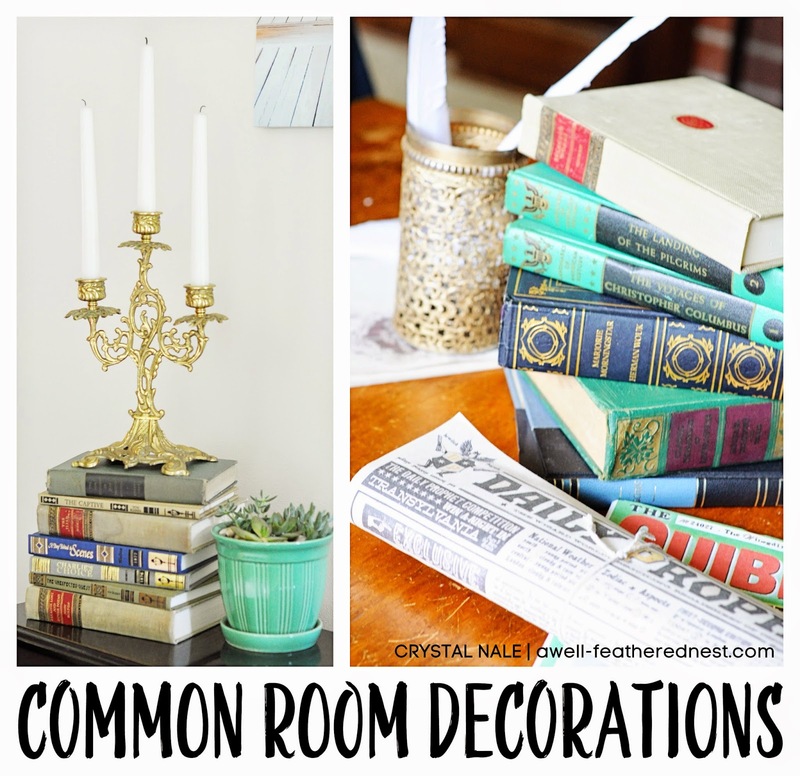 We used tons of classic and older looking books to decorate this display and the common room because I have to think Hermoine would have kept it that way. To make the rest of our living room feel more like the Gryffindor common room, I just decorated the surfaces with old-looking things: books, candles, and other itmes you'd find in the Wizarding World. 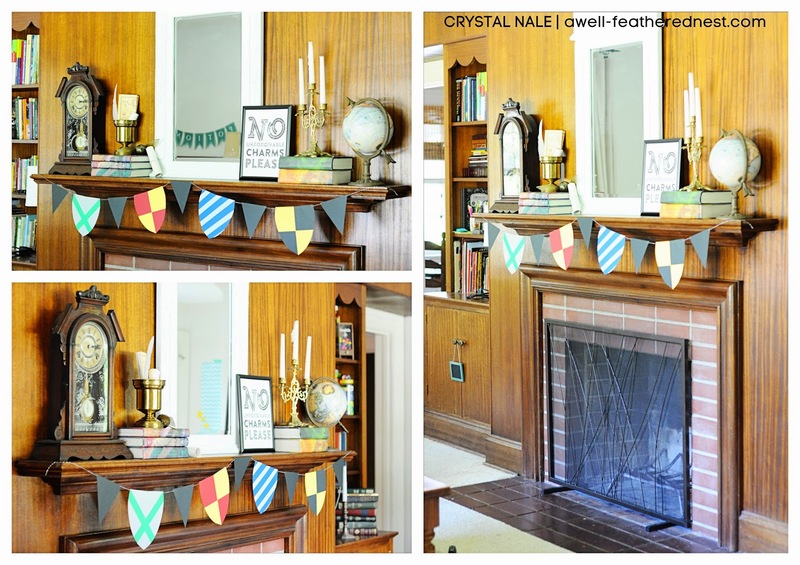 You can find a printable version of the Hogwarts House Bunting in my shop. 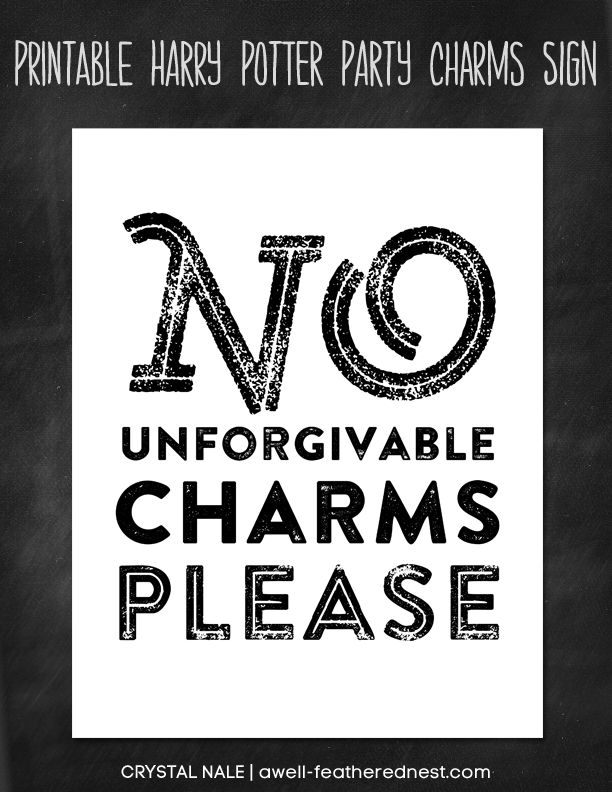 I also printed this Marauder's Map, and I'm sharing a download of the "No Unforgivable Charms Please" sign with you all. 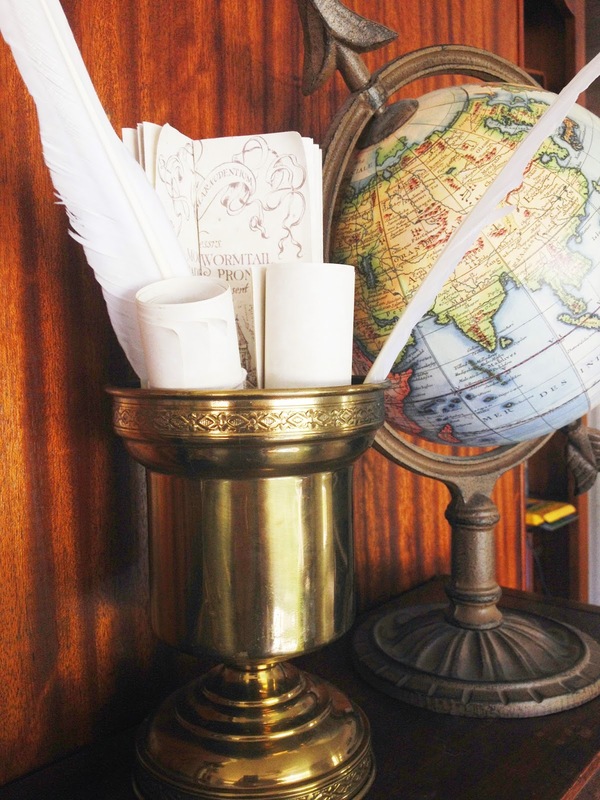 I thrifted the candlesticks and a couple of brass containers to hold some of the wizarding school supplies. I tucked feathers in the containers, and we made quills out of a couple using ball point pens. Oversized (11 x 17) parchment paper was rolled up and tied with plain string to make scrolls. I printed the Quibbler covers and covered a regular magazine with them for a prop, and I also made the Daily Prophet. I printed the header sideways onto some large newsprint-type drawing paper. Then I rolled up a stack of the paper with the printed part on the outside to make it look like a whole newspaper. Pulling all of the decorations for this party together was so much fun. I enjoyed thinking about what items and decorations could help to bring the books to life as we were reading together. In the end, I was very pleased with the results. I was still instinctively looking for interesting items when I was in the thrift store the other day, and I had to remind myself that I'm not collecting anymore. Unless we decide to have another Potter party again someday. Don't forget to check out all of the posts about the details of our party!